The Axis Explosion Protected Network Camera comes in two forms, the Explosion Protected Fixed Network Camera or an Explosion Protected PTZ Camera. XF40-Q1765/XP40-Q1765 Explosion Protected Network Camera is an AXIS Q1765-LE Network Camera (excl. IR LEDs and SD card, incl. wiper and support for washer) mounted inside an explosion protected stainless steel housing. The camera provides superb image quality and color fidelity, and offers full HDTV 1080p resolution at 25/30 fps. With 18x optical zoom and autofocus, the camera is ideally suited for remote monitoring situations common in hazardous areas. 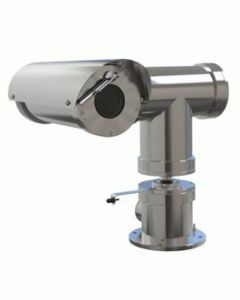 The camera features an electro-polished 316L stainless steel housing certified for hazardous areas according to, among others, ATEX and IECEx. The XP40-Q1765 PTZ camera delivers 360º endless rotation with up to 45º/s pan speed and ±90° tilt with up to 24º/s tilt speed. XF40-Q1765/XP40-Q1765 is ideally suited for video surveillance monitoring in hazardous areas in critical infrastructure such as onshore, offshore and marine environments in the oil and gas industry. In addition, typical application areas are also dusty environments in other industries, for example, paper and textile industries, and grain handling. The outdoor-ready XF40-Q1765/XP40-Q1765 comes in two product versions, depending on the required operating temperature range: either up to +60 ºC (+140 ºF) or down to -60 ºC (-76 ºF). A removable weather shield is supplied with the camera. XF40-Q1765/XP40-Q1765 provides a high level of flexible integration possibilities with other equipment, such as access control, illumination and audio. It offers remote accessibility, using any existing IP-based networks. XF40-Q1765/XP40-Q1765 for hazardous areas is a complement to Axis’ wide range of network cameras that can be used in safe areas.